Those who have been to or have lived in Pondicherry (officially known as Puducherry,) will agree that one of the most beautiful things about the city is its churches. And while there’s no denying that there are some amazing places to visit in Pondicherry such as the beaches in Pondicherry, these churches have a unique charm of their own. The architectural finesse and grandeur of these churches will not just leave you awestruck, but will also take you back into times immemorial that will give you a glimpse of the culture and tradition that the people followed during that era. Looking for hotels in Pondicherry? Click here to find the best deals. Another important thing that you will notice about the churches in Pondicherry is that these churches vary in terms of their architectural designs and structures. That’s majorly because Pondicherry being home to several colonists that included the French, the Dutch, the Portuguese and the British, bears testimony to the different architectural styles that each of these colonists followed. Similarly, you will also find churches belonging to different denominations or affiliations such as the Methodist churches, Pentecostal churches in Pondicherry, and Roman Catholic churches in Pondicherry. Now that you have read so far, let us assume that you are prepared to travel back in time and learn more about these architectural marvels that lure tourists from all parts of the world. 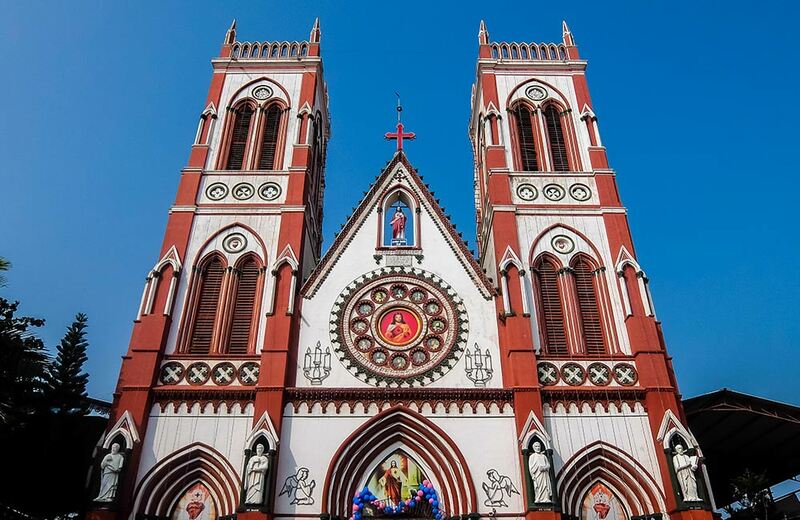 Dedicated to the Sacred Heart of Jesus, this Gothic styled basilica has 100 years old history which was marked by a special postal stamp and postal envelope released to celebrate the centenary year. 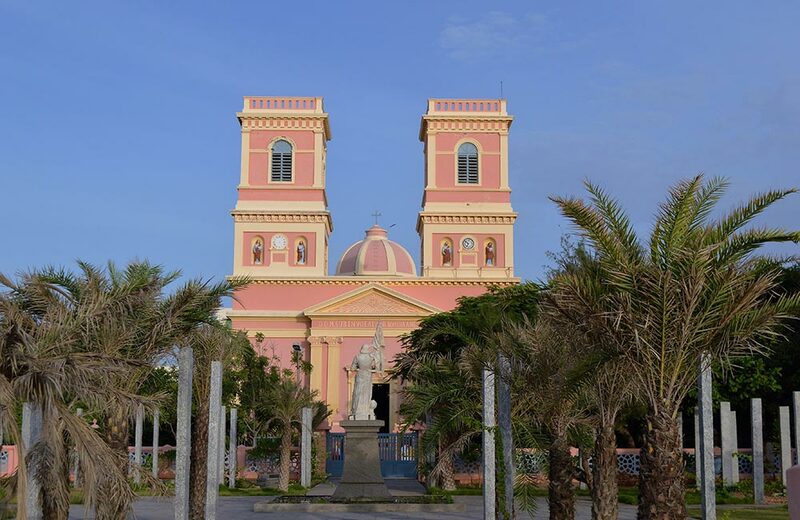 The Sacred Heart Church, Pondicherry is located in the southern boulevard of the Union Territory and is one of the most visited Christian pilgrimage spots. The rare stained glass panels that depict some episodes from the life of Jesus Christ and saints of Catholic church are the main attractions of the church. New additions have been made since the 1960s, which include the Grotto for Our Lady of Lourdes, Parish Hall, Adoration chapel and a community hall. One can see the Papal Decree of Elevation to Minor Basilica is inscribed in Latin and English above the stoup at the main entrance. The beautiful church has chandeliers on the inside and statues of evangelists, describing their lives, have been erected outside. 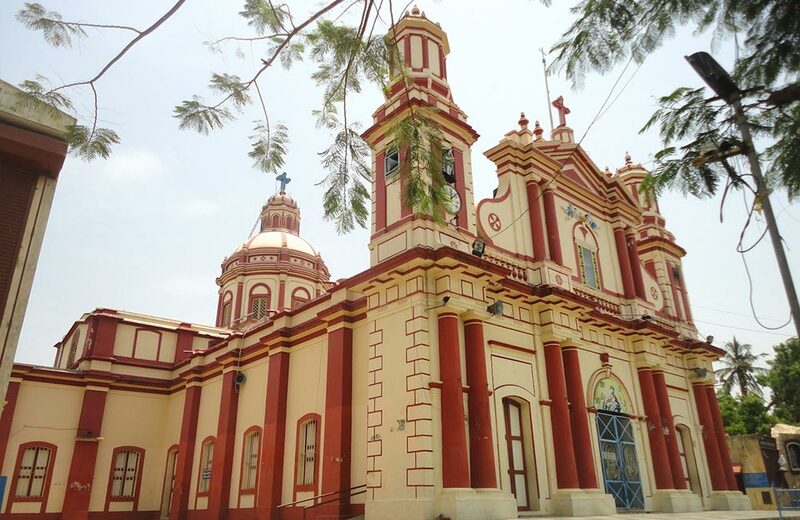 Also known as “Samba Kovil,” Immaculate Conception Cathedral, Pondicherry is located on the Mission street. The 300 years old memorial is the mother church of Roman Catholic Archdiocese of Pondicherry and Cuddalore. It was initially financed and built by Louis XIV, king of France in 1698 and demolished by the Dutch in 1699. However, the second construction was completed quickly, but it did not last as well. The church was rebuilt for the third time and was once again destroyed by the British during the Seven Years’ War. The present cathedral has an altar for St Joseph, Our Lady of Good Health, Sacred Heart, St Therese of Lisieux, St Francis of Assisi along with a Grotto near the main gate. Besides the tombs of the Bishops of the Archdiocese, the church has tombstones of all the missionaries who were buried there. It is one of the oldest places swarmed by tourists in Pondicherry. Our Lady of Angels Church Pondicherry is the only church in the city where mass is celebrated every Sunday in three languages – Tamil, English, and French. Napoleon III built the original structure that was inspired by Greco Roman architecture in 1855. The premises of the wondrous church have two pillars, which housed clocks that struck every two hours and sang Ave Maria. They are, however, no longer functional. The church has undergone several changes such as the humongous bells procured from France do not ring anymore as they caused neighboring buildings to vibrate beyond what they were constructed to endure. Despite the upgrades and renovations, you will enjoy the peace and serenity while sitting inside the church. 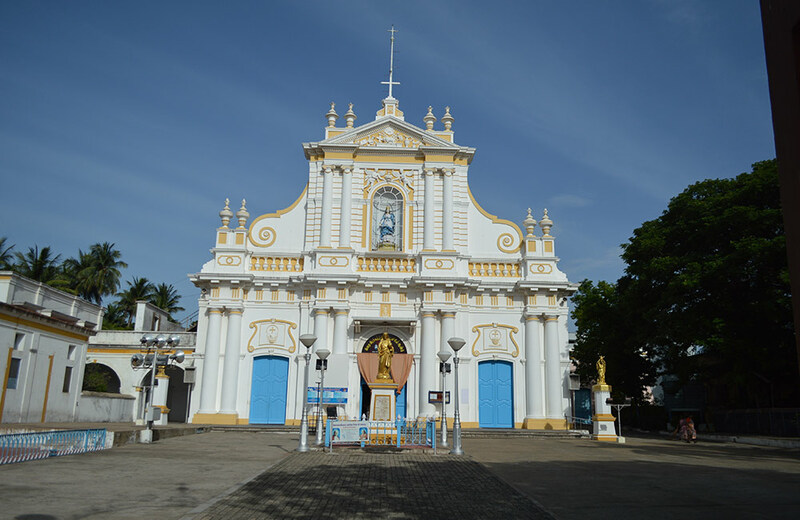 The first chapel to be named after Our Lady of Lourdes outside of France is a famous shrine devoted to Blessed Virgin Mary and is located in Villianur Town of Pondicherry. The site is home to a six-foot-tall stone statue of Our Lady of Lourdes, which has been there since 1877. The statue is a testimony to several miracles in the late 19th century and was officially declared a Shrine. The first Saturday of every August brings thousands of followers to the most awaited event where Holy Water from Lourdes Church of France is poured into the Sacred pond in front of the chapel. It is believed that the pond water can bring forth good fortune and cure the ones suffering. It is also the only church in Asia to have a naturally formed pond. No doubt, this makes it one of the most significant places and a must-visit church in Pondicherry. A vision of Gothic architecture and built by Kanakaraya Mudali in 1745, St Andrew’s Church is another distinguishable and notable landmark in Pondicherry stateliness. It is merely 4.2 km away from the city center and is one of the oldest churches in Reddiarpalayam area. The inaugural ceremony hosted people of all religions and castes, making it the first of its kind to hold a feast in the times of reservation. St. Andrew’s Church is one of the first churches to have Tamil inscriptions. A grotto of St Andrews is located at the entrance of the vestry. The altar has traditional Catholic imagery and a vestry for devotees to experience the tranquility. Presently, the church is under the dominion of Archdiocese of Pondicherry and Cuddalore. While the church holds mass every day at different times, many tourists visit the place for its sheer beauty and design. 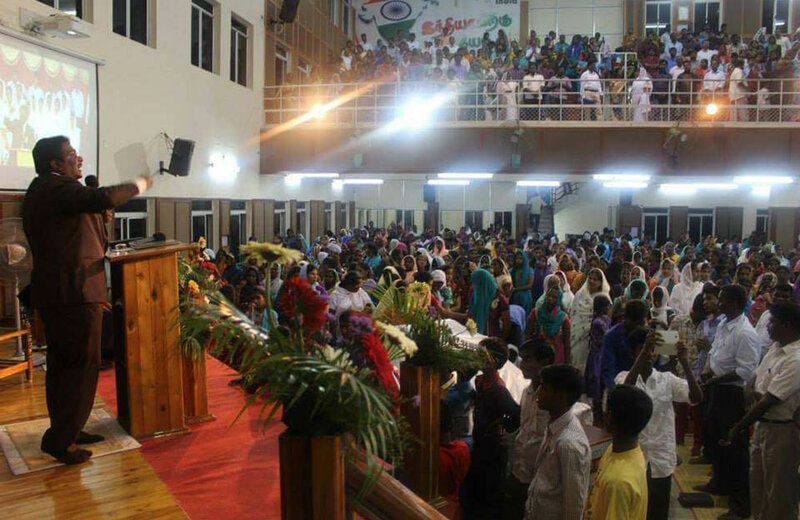 A church started in a rented house is now a building that can accommodate 3000 people. Rev. I Asir and his family fought many hardships with bravery and determination to make this passion a reality. 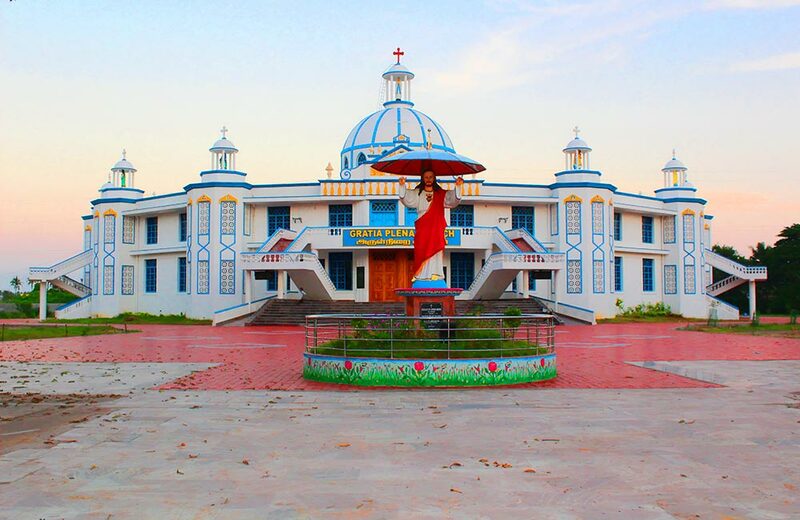 Hallelujah Assembly of God Church is the mother church of 30 assemblies in the Union Territory. Before the church owned a land, early worships were conducted in temporary spaces and rented houses. However, the desire and devotion of the pastor ensured that the church missionaries were supported throughout the tough times and all the way through. The church still provides aids to many missionaries around the country to spread the word of god and his work. The church is located in the heart of the Union Territory and welcomes every man, woman, and child. Their mission is to provide everyone with a moment to understand the teachings of Christ and have a common platform where they can grow through the magnificence of God. If you are planning a trip to Pondicherry, make sure you have these churches on your travel itinerary. Besides the above-mentioned churches, Pondicherry is also famous for its food. Here’s a list of some of the best restaurants in Pondicherry that serve lip-smacking delicacies. And just in case you want to check out the party scene in Pondicherry, here are the pubs in Pondicherry that you must visit.